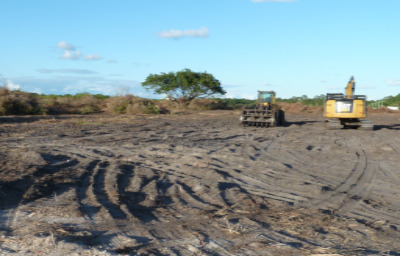 We broke ground on our orbital vehicle manufacturing site in Florida. The 750,000 square foot rocket factory is custom-built from the ground up to accommodate manufacturing, processing, integration and testing. Among other things, the facility hosts large scale friction stir welding and automated composite processing equipment. All of the vehicle will be manufactured in this facility except for the engines. Initial BE-4 engine production will occur at our Kent facility while we conduct a site selection process later this year for a larger engine production facility to accommodate higher production rates. I’ve included some photos that will give you an idea of what the vehicle manufacturing facility will look like in December 2017 when it’s complete. It’s exciting to see the bulldozers in action--we’re clearing the way for the production of a reusable fleet of orbital vehicles that we will launch and land, again and again. The facility floor slab is planned to be competed by December of this year. Is that rendering of the three Blue Origin boosters in the 3rd image our first look at their orbital launch vehicle? Looks like it. So now we know they will use 3 engines on their "smallest" vehicle? Can't anyone estimate the booster size with based on the truck tires wheeling it out? I'll try to measure similar ones tomorrow. Could be a teaser/sneak peek, or could be artistic license. If it's not just made up; three engines, possibly three core first stage? No need, really. We know the booster would be powered by BE-4. Sorry for the confusion. Obviously it'll be powered by the BE-4. They've stated that many times. But what size does that make the booster? Looks like 5m diameter and 30m long? 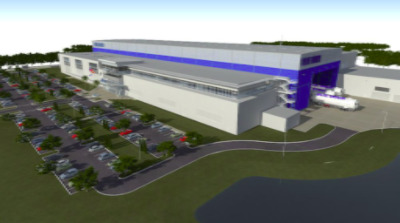 Public records show Blue Origin’s main manufacturing facility will measure 725 feet long, 345 feet wide and 75 feet tall, with a “super high bay” rising 82 feet. 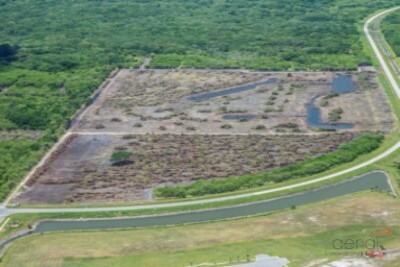 KSC Director Bob Cabana recently compared the factory's footprint to that of NASA's 52-story Vehicle Assembly Building. 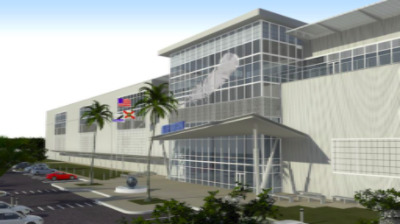 And Blue Origin's Exploration Park plans leave room for an additional 150,000 square-foot manufacturing building and 50,000 square-foot processing facility that could be added later. Using the reported 82-foot height for the "super high bay", I get a booster length of about 70 ft and diameter of about 15 ft.
For comparison, the image below was the "first look" at Blue's orbital vehicle from last September. The fineness ratio looks correct, whereas the fineness ratio of the booster shown in the facility rendering above is consistent with a New Shepard model that the artist scaled up and tweaked for convenience, too short to be a real first stage, so I wouldn't put much stock in it. I measured transporter wheels today - there are two sizes, but I left my notes at work so won't burden the numerologists among us with wrong figures - tomorrow will have to do! Could it be just the H2 tank and motors? An unseen section with another 25% for LO2 and interstage would seem to be about the correct proportions. I doubt it, as you wouldn't have a relatively finished booster with engines attached but missing one of its tanks, and why would the artist render only half a stage? This press release is all about the facility, with other bits stuck on around it. IMO, the booster rendering is a bit of artistic license pasted on for effect. Unlike the rendering Bezos showed, which makes sense proportionally. Progress as of July 1. Ewww.. they've building it with Haskell? I think what you mean is: "Yay, they are building it with Haskell! ". I'm curious too, and a search wouldn't tell me why. The company is headquartered in Jacksonville where I grew up and now live. Their contract history as reported by our business journal has been quite impressive. The founder Preston Haskell has been a generous benefactor to many important causes locally, and it happens my brother's brother-in-law is their lead architect, a very intelligent and nice man whom I think you actually would like QuantumG.